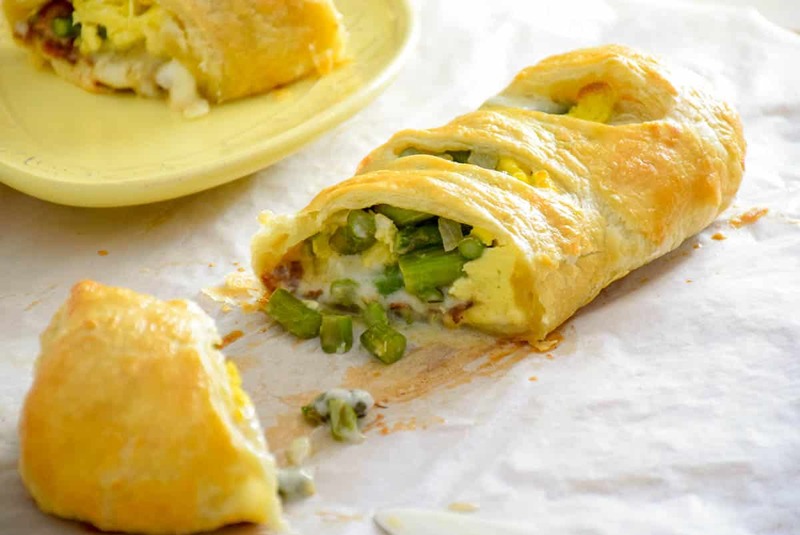 When I think spring, I think of recipes like this Asparagus, Bacon, Egg and Cheese Strudel! The bright flavor of asparagus combined with the richness of the bacon egg and cheese is over the top delicious. 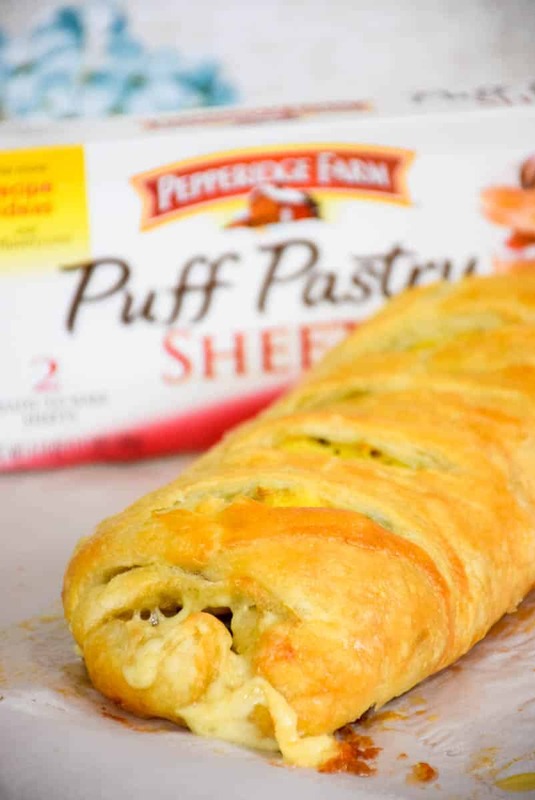 Made over the top delicious with Pepperidge Farm® Puff Pastry Sheets. A spring recipe impossible to resist! This Puff Pastry creation was inspired by my favorite sandwich, the Grilled Asparagus, Taleggio, and Fried Egg Panini. 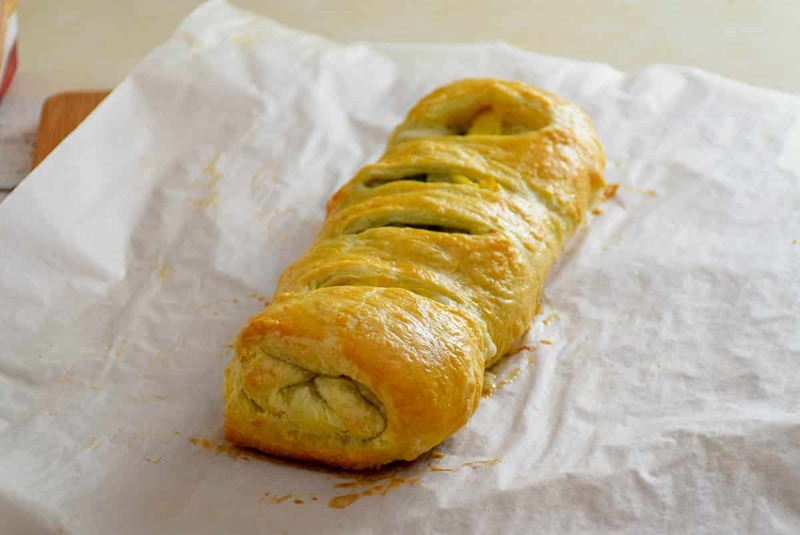 I love the combination of flavors in this sandwich and wanted to recreate it with the delicious flavor and crispy texture of the Puff Pastry. 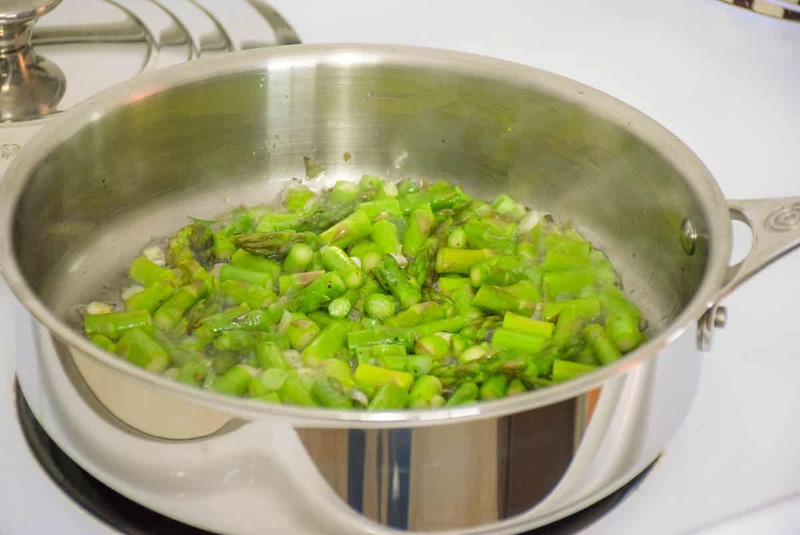 To make this recipe, I sauteed the asparagus it in a little bit of bacon fat along with the onion. Roasting is a good option also if your looking for that roasted vegetable flavor. Once the asparagus is cooked, I like to brighten it up with just a little bit of little lemon juice. I cooked it until it was crisp tender then removed it from the pan and scrambled my eggs in the same pan. Then I combined the eggs with the asparagus and set aside. A strudel is usually a pastry rolled up around a fruit filling that is baked. 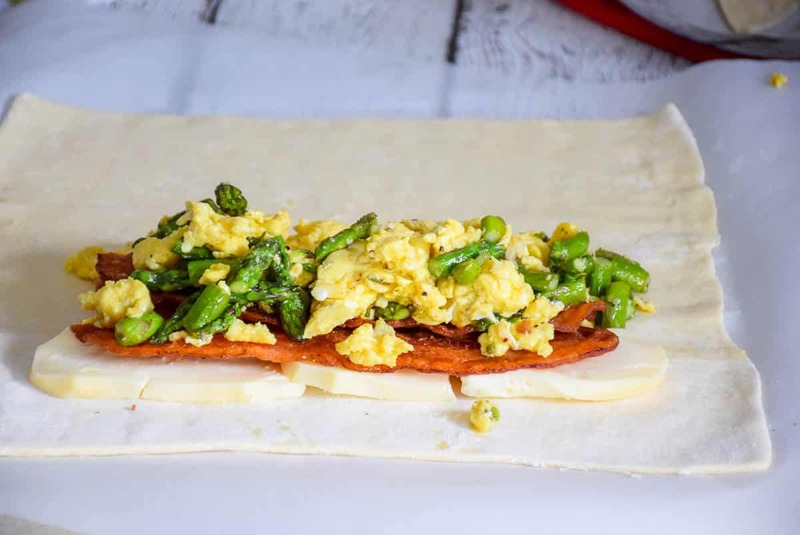 While I love a fruit filling, I really love a savory one also and this breakfast strudel makes your spring brunch so delicious! If you have never worked with Puff Pastry before, you may be wondering how to thaw it out. If you are like me, you might completely forget to remove it from the freezer to thaw it on your counter. You can still do this if you have 40 minutes to spare. 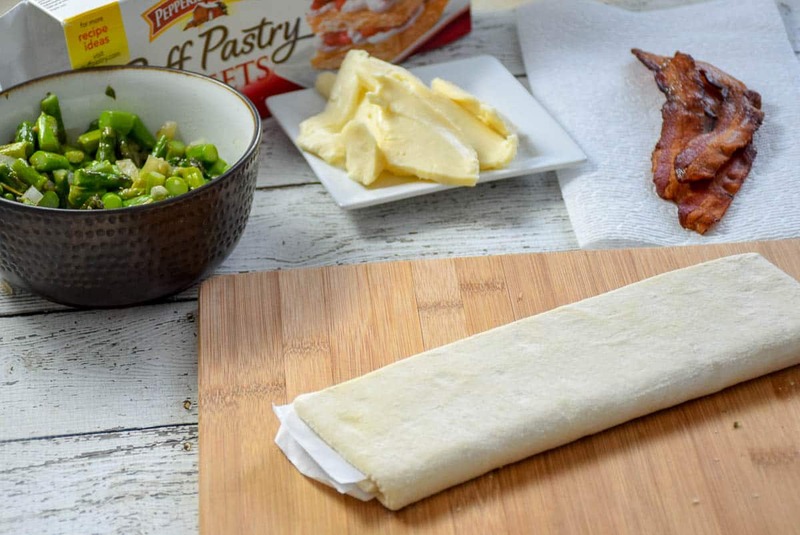 You can also thaw the Puff Pastry in your microwave in under one minute! Start with one sheet in the microwave for 15 seconds, turn it over and microwave for 15 seconds more. If you still can’t open it easily, put it back in for 5 more seconds on each side. You should be good to go by then! To get that golden crust you see in the photo above, I brush my pastry with an egg wash. Whisk 1 egg with 1 tablespoon of water, then brush with a pastry brush until it is completely coated! The flavors and textures blend so perfectly in this gorgeous strudel. Once you take a bite, you’ll definitely be looking for more! Your family will not be able to wait to dig in! Thankfully this recipe makes two strudels and it also reheats very well if you have leftovers. 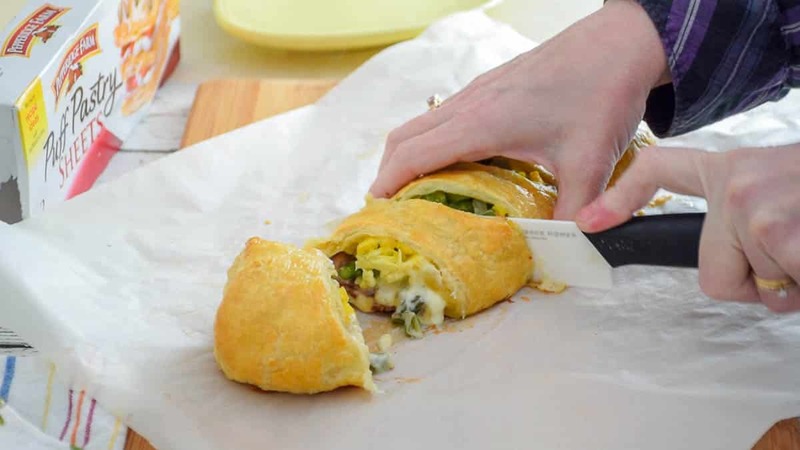 Make brunch special this spring, whether it is a weekend family brunch or special holiday gathering and serve up this delicious, savory strudel. Watch how easy it is to put together in my video! Watch how easy it is to make this recipe! Asparagus, Bacon, Egg and Cheese Strudel! 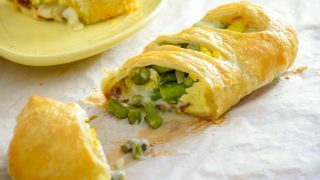 The bright flavor of asparagus combined with the richness of the bacon egg and cheese wrapped in flaky puff pastry. Precook bacon and set aside. Pre-heat oven to 350 degrees. In a large skillet, heat bacon fat or butter over medium heat until melted. Add asparagus and onions and stir to coat with bacon fat or butter. Cover with lid and let cook about 45 seconds. Remove lid, season with garlic salt. Toss asparagus mixture. Cover with lid and cook about 1 minute more, until asparagus is bright green and fork tender. Remove from pan and set aside. In a large mixing bowl, whisk 5 eggs until well blended. Pour eggs into same skillet you cooked the asparagus in. Stir, scrambling eggs until just still slightly wet. Remove from pan. 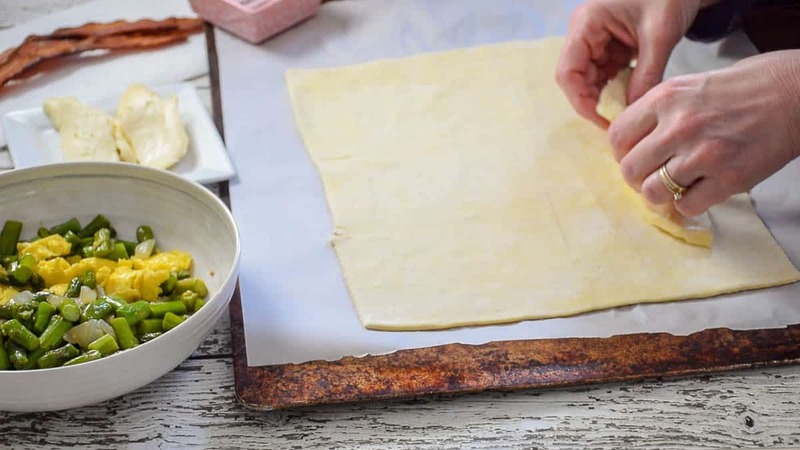 Prep puff pastry by rolling out on a board. Pressing lightly and rolling out to stretch dough into rectangle. Place cheese on dough lengthwise near the edge closest to you. Layer with 3 slices bacon, 1/2 of the egg and asparagus mixture. Dampen edges of puff pastry with fingers that you have dipped in water. Fold over long edges of dough then taking the dough close to you, roll it over the filling, tucking in the seams on the edges as you roll. Place seam side down on parchment paper lined cookie sheet. Slice a diagonal vent across the top of the dough. Repeat down the length of the dough, making 4 cuts. Whisk the egg and 1 tablespoon water until well blended. Using a pastry brush, brush the dough with egg wash until completely coated. Pin it! Asparagus, Bacon, Egg and Cheese Strudel! I just the love the fact that this is a great brunch or breakfast and its easy to make. The best part is that flaky crust cant wait to get out and buy some puff pastry today! Always looking for new ways to use our asparagus and this one looks fantastic! Looks terrific! Puff pastry is the best shortcut and these look terrific! This sounds delicious! Perfect for Easter or Mother’s Day! Mmmmm THAT combo sounds like HEAVEN!! Especially when you wrap it all up and can eat it with your hand! Ah such a delicious looking strudel!! 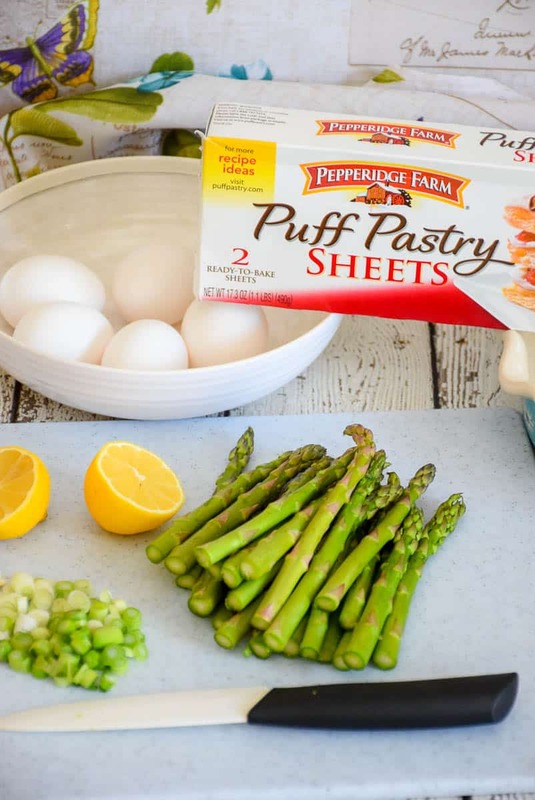 I love Pepperidge puff pastry, my freezer staple!